From alternative transportation solutions and waste diversion efforts to environmentally-conscious exhibitions, ArtPrize visitors will have more opportunities than ever before to consider and participate in sustainable practices at the eighth annual event. GRAND RAPIDS, Michigan (SEPTEMBER 15, 2016) -- ArtPrize, the radically open international art competition decided equally by public vote and expert jury, today announced its 2016 Environmental Sustainability programming during the 19-day event as well as year-round—including alternative transportation, recycling and composting, and community-driven solutions. ArtPrize invites visitors to take part in these efforts to create a more sustainable future at the eighth annual event, held from September 21–October 9, 2016. ArtPrize promotes alternative transportation solutions to lower carbon impact of the event and encourage healthy living. Visitors have the option of taking the bus, biking, or walking to experience the event. Each solution encourages participation in different modes of getting to and around ArtPrize in an environmentally conscious way. Visitors interested in taking the bus can purchase an ArtPrize Metro Pass for $5 and receive unlimited rides on the Silver Line and 10 rides on The Rapid’s fixed routes for the duration of the 19-day event. Metro Passes will be available at all ArtPrize Neighborhood HUBs as well as at seven area Meijer Park & Ride locations. Additionally, ArtPrize has expanded its Rapid Rides to ArtPrize program—presented by The Rapid and Blue Cross Blue Shield of Michigan/Blue Care Network—to grant 10,000 individuals with a free Event Guide, Map and Metro Pass. Working closely with Grand Rapids Public Schools, Early Learning Neighborhood Collaborative, Head Start for Kent County and many community organizations around Grand Rapids, ArtPrize seeks to distribute these key resources to those who might not otherwise have access to them. ArtPrize goers can also choose to bike around the event. Bike corrals will be available around the district including the HUB/HQ, located at 41 Sheldon Blvd, and at the Clubhouse, located at 50 Louis. City-wide parking and bike repair locations can be found at downtowngr.org and bikes can be rented from Grand Rapids Bicycle Co. Guests of the JW Marriott or Holiday Inn Grand Rapids Downtown can also rent bikes through their respective hotels. Additionally, ArtPrize and X-Rite Pantone once again present nearly ten miles of Pathways—identified by colorful sidewalk markers—winding throughout the event district. Each Pantone Pathway is a starting point, from which visitors can explore off the beaten path and find themselves within one block of 90% of ArtPrize Eight venues. ArtPrize has partnered with The Wege Foundation, The City of Grand Rapids, Kent County and WMEAC for the eighth annual event to increase city-wide waste diversion, recycling and composting efforts as well as promote the use of reusable products. Launched at Grand JazzFest, the S.O.R.T—Separate: Organic, Recycling, Trash—initiative aims to keep Grand Rapids green and clean while educating the public on recycling opportunities. At ArtPrize Eight, S.O.R.T. will provide recycling stations at HUB/HQ, Vandenberg (Calder) Plaza, and Rosa Parks Circle. The S.O.R.T. program’s goal is to have 90% of waste diverted by 2030, and visitors can help reach that goal at ArtPrize Eight. Now in its third year, the ArtPrize Water Share Program—presented by Spectrum Health—aims to reduce the prevalence of single-use water bottles at the annual event, and to strengthen the basic principles of water conservation by informing and educating visitors about the importance of hydration and reductions in resource consumption. 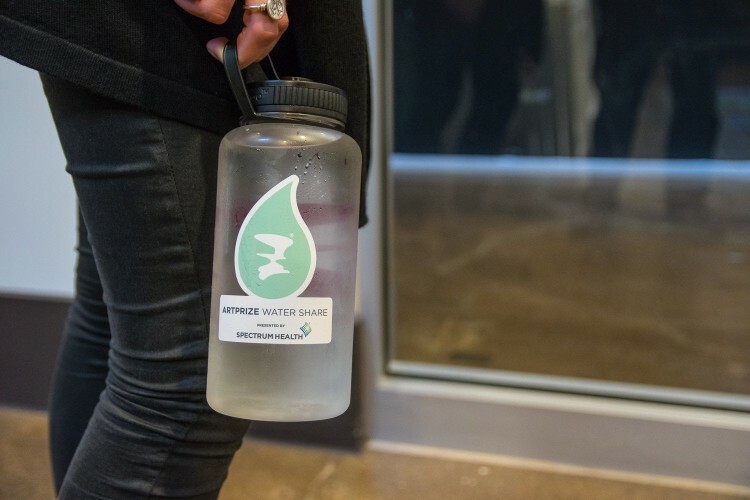 Through this program, ArtPrize will distribute 10,000 Water Share stickers to visitors at no cost—allowing them to fill their reusable water bottles at 26 participating Venues throughout the event district, as well as at four Absopure Water Company fill stations located at ArtPrize hospitality spaces. Visitors can pick up a free Water Share sticker at any Neighborhood HUB throughout the 19-day event, while supplies last. With the support of the Wege Foundation, the ArtPrize Venue Sustainability Guide is a featured resource guide packed with green pro tips, best practices and partner referrals to help ArtPrize Venues implement green programs during ArtPrize and throughout the year. The guide covers impact, measurement and planning in areas like customer experience, waste diversion, water conservation—even artist de-installations, catering and events. ArtPrize Venues and visitors can download the guide from the ArtPrize website or ask about it at any of the ArtPrize Neighborhood HUBs. ArtPrize provides a space for open dialogue and aims to spark and enrich conversations around environmental sustainability. For the eighth annual event, ArtPrize institutional venue and partner Kendall College of Art and Design of Ferris State University (KCAD) has teamed up with Goodwill Industries of Greater Grand Rapids (Goodwill) to engage visitors in a conversation about the opportunities for more sustainable living that exist all around us. Now open to the public, KCAD’s ArtPrize Eight exhibition, RE•, features local and international artists whose work focuses on themes of human production, consumption and issues of environmental and social responsibility as well as conceptual work that grapples with connection, rebirth, preservation, cultural equity and social justice. Goodwill provided RE• artists access to their stores to find and repurpose used materials that otherwise could have been discarded.